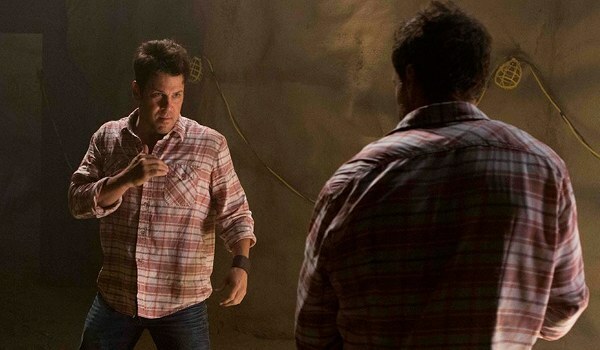 The discovery of caves beneath an oil drilling site followed by unusual behavior in the town sends Jake (Christian Kane) home along with Cassandra (Lindy Booth) and Ezekiel (John Harlan Kim) to investigate the cause. Getting wrapped up in old family drama with his estranged father (Jeff Fahey), Jake at first misses the evidence of what was released from the caves and is now causing havoc around the small town. Although it doesn't give much for Eve (Rebecca Romijn) to do, "and What Lies Beneath the Stones" does give us some deeper background on one of the new Librarians helping to explain his habit of hiding his genius to the outside world while offering another storyline for the three Librarians to work together and solve a problem. To defeat the mischievous shapeshifter released from the caves and return it to its prison, each of the Librarians will have to be true to each other and themselves and stop the lies that the creature feeds on.